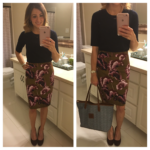 Last month I did my first ever post with Lord & Taylor. I titled the post Back To Basics, and I absolutely loved the pieces that I found and featured. 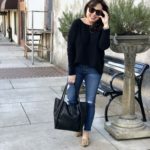 The quality was excellent, and that post made me realize that Lord + Taylor could definitely be a new option for me to shop on a regular basis. I received lots of great feedback from readers as well. There were some of you that already loved the brand and were excited to see me start to feature a store that you already shopped. Others had never shopped Lord + Taylor before, but you were interested to see what they had to offer and were definitely open to the possibility of shopping there. Well, I think today will strengthen my Lord + Taylor case. I love every single piece I’m featuring, and I have great news! For the first time ever, Lord + Taylor is offering up to 30% OFF just about EVERYTHING in store and online today! Every single item I’m featuring today is up to 30% OFF! There’s a Buy More, Save More sale happening. If you buy just 1 thing, it’s 20% OFF. Which is awesome! If you buy 2 things, they’re both 25% OFF. If you buy 3 things, they will all be 30% OFF! And keep in mind that Lord + Taylor carries many brands that we already know and love! For example, Steve Madden shoes can be found HERE, and Sam Edelman shoes can be found HERE. 30% OFF is no joke! If there is anything you’ve had your eye on, now is the time. I’m showing two different looks today with lots of gold jewelry and some bold animal prints. And I’m featuring a couple of different items from the L + T Faves section! 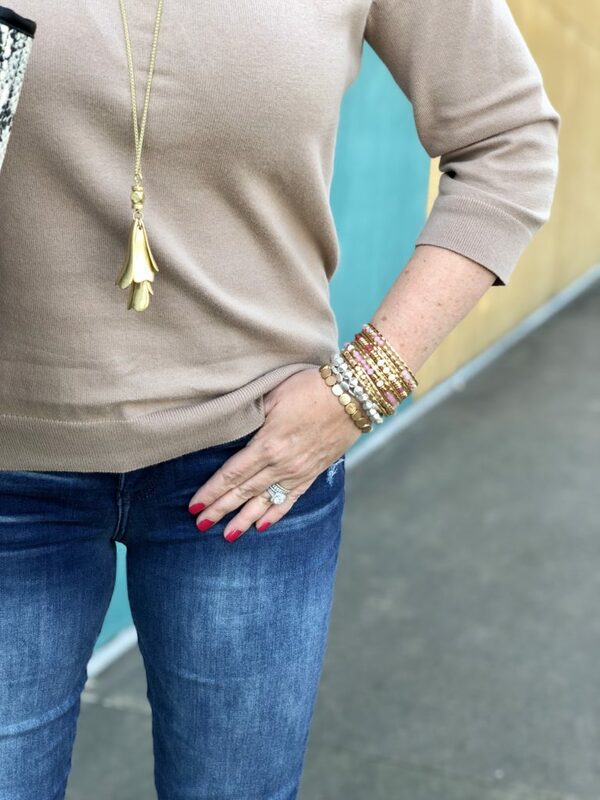 Everything in today’s post was inspired by a really simple piece: a crew neck camel colored sweater (a L + T Fan Favorite)! And keep in mind that it’s already ON SALE, and today it’s up to an additional 30% OFF! You could get this amazing sweater for as low as $20.99! I’ve featured a camel sweater before that was v neck, but it sold out immediately and never restocked. I know many of you were disappointed, so when I found this one, I knew I had to grab it. And guess what? I like it even more than the one that I originally featured, and it’s just as affordable! 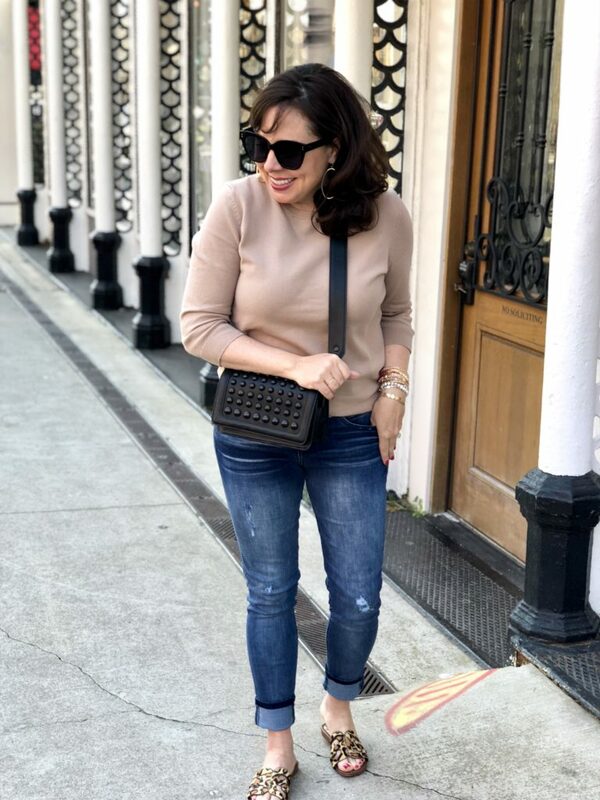 The crew neck makes it classic and chic, and the 3/4 sleeves and light knit really make it a year- round sweater. It’s a relaxed fit and machine washable, which is a win win for me. When searching on the site, the official color is “dark sand”, but it really is a beautiful camel color and it comes in 10 additional colors as well. I sized up to a medium in the sweater, and I’m glad I did. I despise clingy sweaters and the medium is a perfect relaxed fit for me. Here is the entire look. 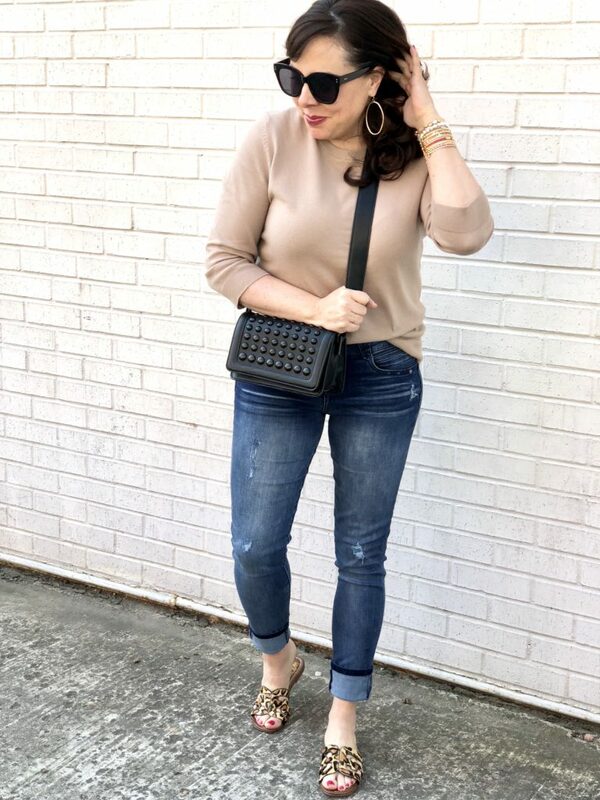 The jeans are a new brand for me, also an L + T Fave, and I think they are great! They are very similar to another brand I love, and I’m thinking they must be owned by the same company. This particular pair of jeans features “Ab”solution technology, just like my other beloved pairs. The technology incorporates smooth and super stretch denim, slimming panels to mold and hold, a hidden inner waist band for a no-gap waist, and mesh panels for tummy control. They also have strategically placed pockets designed to enhance your shape. I’m wearing my regular size 4s, so I think they are true to size. They are already very affordable at just under $80, but 30% OFF the already low price would make them a total steal at $54.60! I mean, jeans that work hard to help me look my best? Sign me right on up. The waist of the jeans is incredibly comfortable and stretchy. And they stay put! No tugging on them throughout the day! The large tote is the item providing the animal print for this first look. It is super roomy and would be a great travel or work bag. Plenty of room for a laptop, all sorts of essentials (wallet, make up bag, keys), and even a jacket and a water bottle. There’s one interior open compartment as well as a detachable zippered pouch. 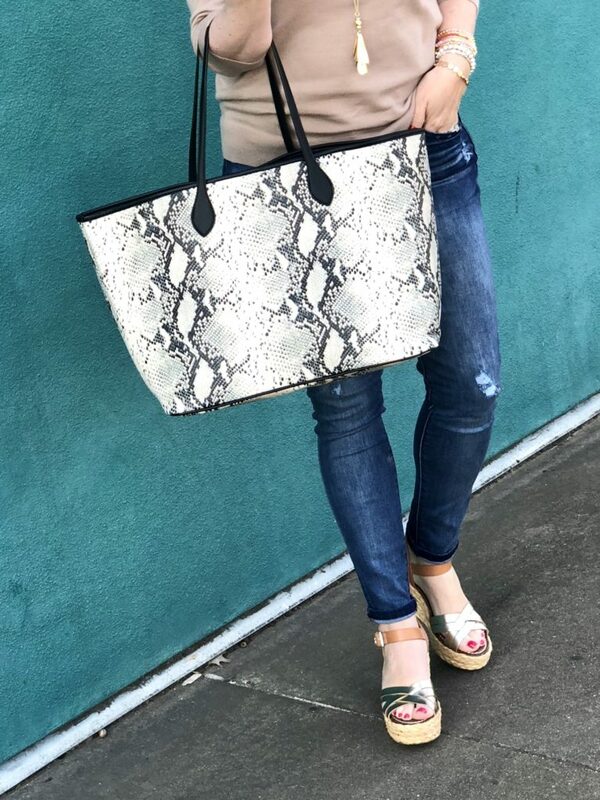 The tote was already on sale, and if you get the full 30% OFF, it will be ONLY $46.20! The jewelry is all lovely. You’ve seen the necklace several times before, and it just continues to prove that it goes with so many different looks. 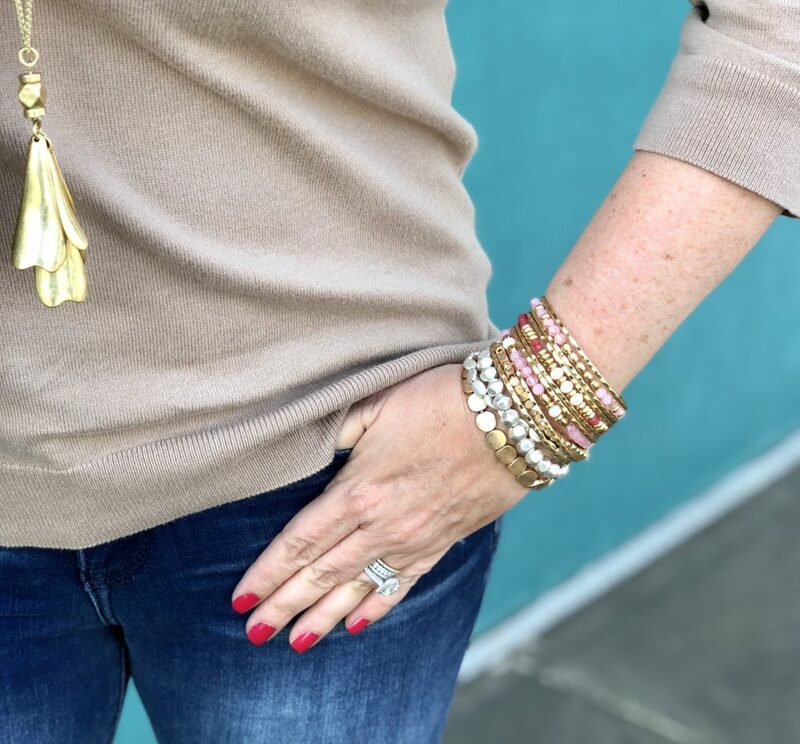 The bracelets are new, and I loved stacking these on top of each other for a really pretty gold, silver, and pink combination. They are all amazing deals, but if you get the full 30% OFF, the pink and gold cuff will be only $11.19! The mixed metal stack would be only $17.50. These free form oval hoops provide a ton of bang for your buck. They are light as a feather and still make a statement with their size. My lipstick is “fashion icon metallic” and you can find it HERE (also on sale)! Ladies. These wedges are DARLING and an incredible deal at up to 30% OFF. Even if they are the only thing you buy today, you will get 20% OFF. The wedges are true to size for me, but if you are sometimes between sizes, I would suggest sizing up a 1/2 size. Notice how I turned just the hem of the jeans up to make them a tad bit shorter. 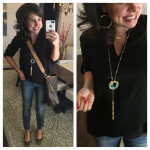 You’ll see in my next look how the jeans look cute with a larger cuff too! 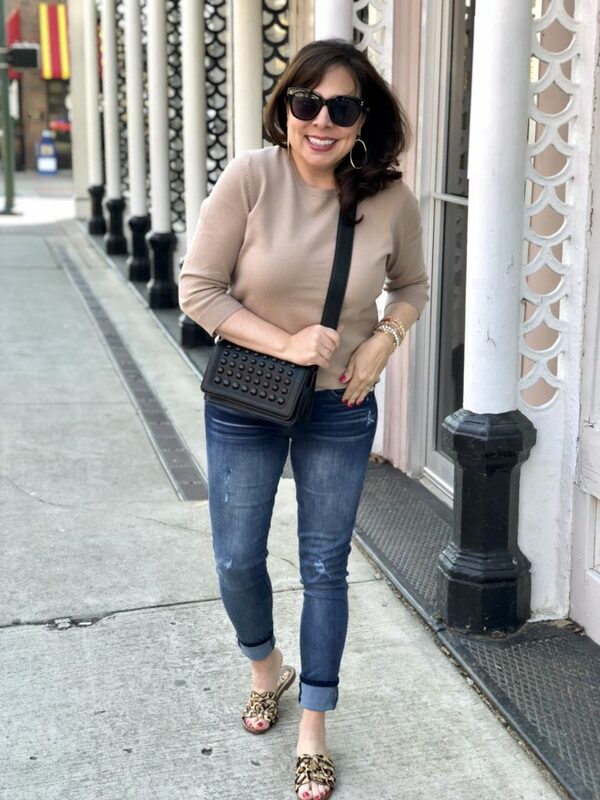 I’d also like to mention that although this sweater is obviously great worn casually with regular denim, it would also look fabulous with white and black denim. And it would be very easy to dress up with a nice pair of slacks. THESE are a L + T Fave, just like the sweater. Pair any one of the sweater colors with these pants and some nice pumps, and you have an outfit perfect for the office. 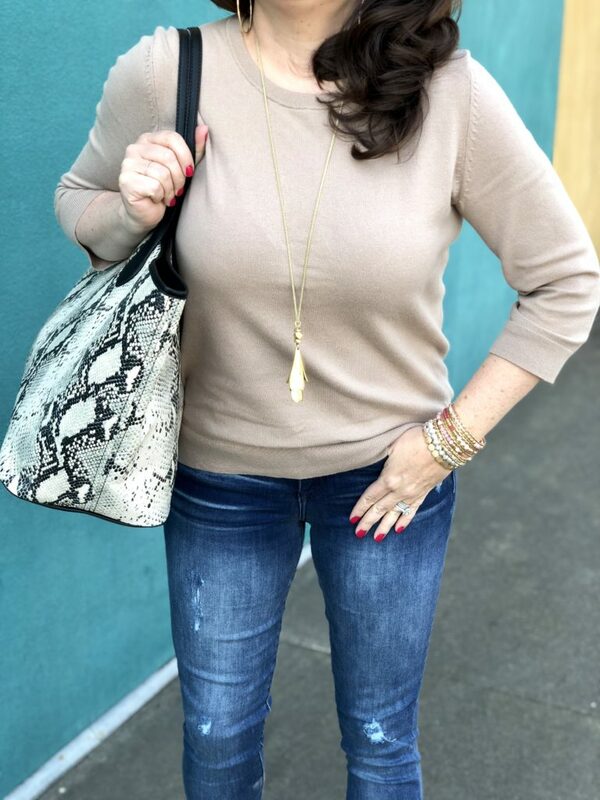 For my 2nd look today, I just switched things up a bit by trading an animal print bag for a more neutral bag and trading a more neutral shoe for an animal print shoe. I love a switcheroo. 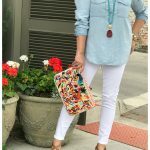 I made the look a bit more casual by creating a larger cuff with the jeans and wearing flat sandals. I’m pretty much in love with the bag . I’ve always really liked carrying a cross body, and I’ve been noticing how some of them are a bit shorter now, so I decided to go for it with this one. You could of course carry this one over your shoulder, but if a bag can be carried cross body, you can rest assured that I will. The foot bed of these sandals has some padding, which makes them very comfortable. I love how they are easy to slip on, but they do stay on my feet without sliding off. I can wear these all day long with no trouble, and I like how I don’t have to mess with any buckles. True to size for me, but you might want to consider sizing up a 1/2 if in between sizes. And at up to 30% OFF they are a total steal. If you buy 3 things today, they will be $70 (instead of the regular $100). If you like the shape of these sandals, but you don’t like the leopard, click HERE to see other color options. And because I want to make sure you fully recognize the greatness of the sweater I’ve highlighted today, check out the other colors! 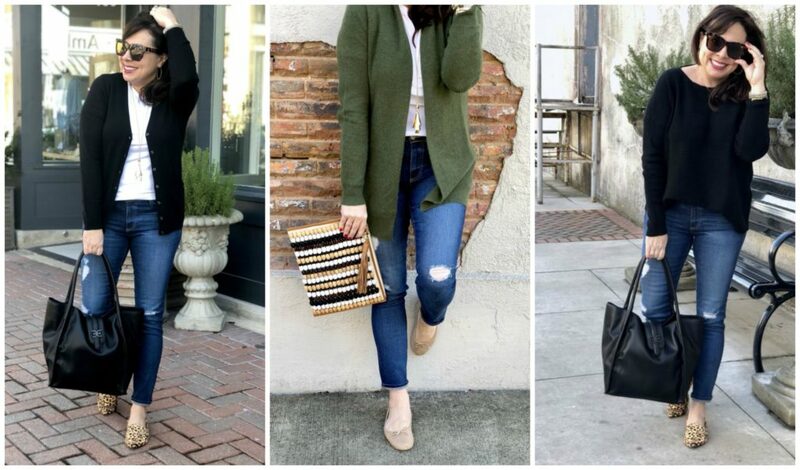 It truly is a perfect closet basic. Great on its own, perfect layered under a blazer or denim jacket, can be worn year round, and can easily be dressed up or down. It’s a classic piece that will never go out of style. And to top it all off, it’s super affordable…especially today! And in honor of the BIGGEST SALE OF THE SAESON (that ends tonight! ), I thought it would be a good idea to visit last month’s post since many of the items I highlighted are still available and NOW ON SALE! Click HERE for the post for all of my thoughts and sizing information. 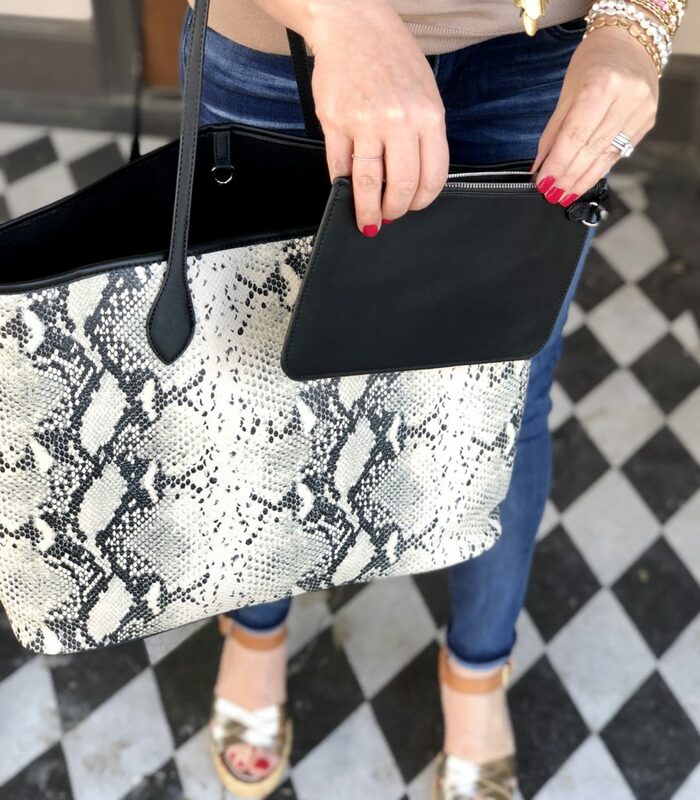 It’s so exciting that the AG jeans, the black tote, and the beaded clutch are still available and ALL ON SALE! 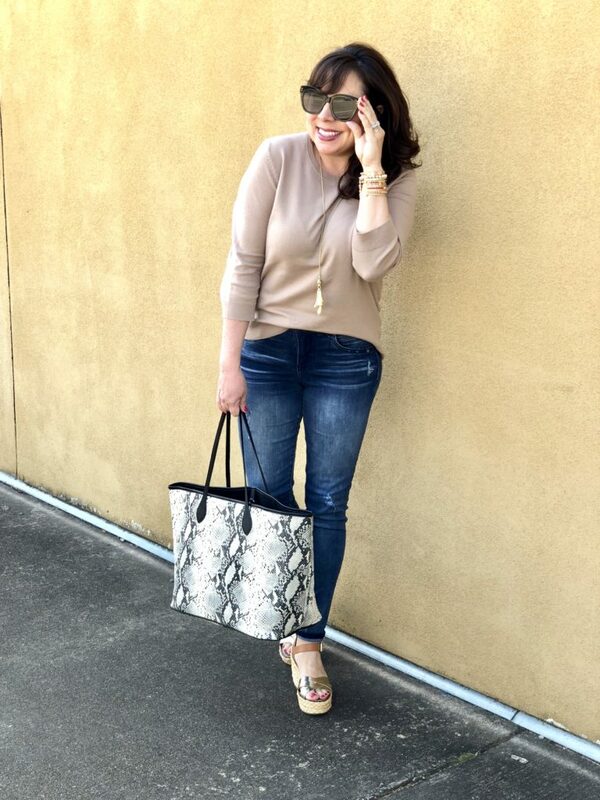 A huge thank you to Lord + Taylor and ShopStyle for sponsoring this post AND for hosting such an amazing sale! If you are new to Lord + Taylor and not very familiar with the brand, you should definitely take a look around today with the up to 30% OFF promotion. You can find home items HERE, and if you want to get familiar with the brands they carry, click HERE for a list. Have a great Monday, ladies! And come back tomorrow for a short little post on a Tuesday! You had me at the title! Those gold wedges are too, too cute! I’m pumped! 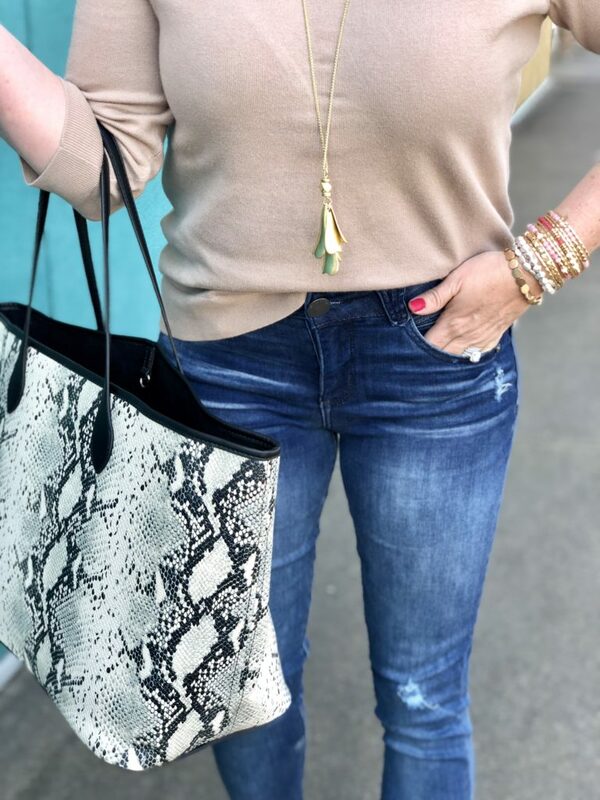 I wanted the leopard sandals and the jeans, so I threw the bracelets in my cart too so I could get 30% OFF of everything! What a great deal! So the jeans are like Wit and Wisdom? I’m trying to purchase the mixed metal bracelts but I’m only getting a 20% discount of $5 when I put them in my cart. Is there a discount code to get 30%? Thanks! Hi, Karen! I updated the post at 5:30 this morning with more accurate sale information, but if you are reading through a blog reader, it might not have updated yet. If that’s the case, you might need to refresh the post. It’s 20% OFF for 1 item, 25% OFF for 2 items, and 30% OFF for 3 items. So sorry for the confusion. Can you tell me where you were reading from? Thanks! I usually read your posts in my email but then just click on the hyperlink for any item I want to view further. Sometimes that will take me directly to your blog. Not sure what a blog reader is. Hope that helps. 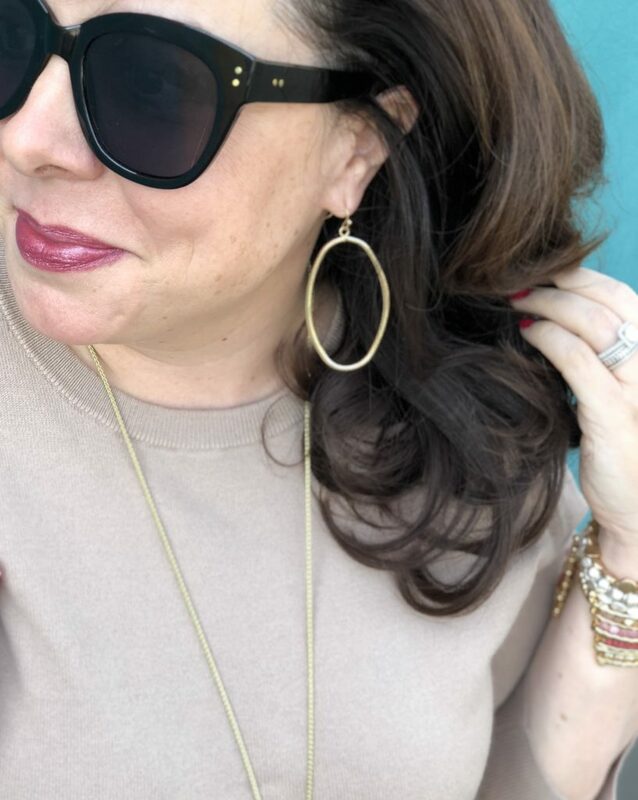 I love those gold hoops. How do they compare with your favorite ones from Nordstrom? The price of these make it very tempting. So many cute finds, Sheaffer! I love those gold wedges and those leopard slides. Adorable! Hi! What sunglasses are you wearing? Democracy jeans are my VERY favorite! They are better than Wit and Wisdom, IMO. Love love love them! I love my Democracy jeans too, Margaret. I have 2 pairs and they both fit me perfectly. Sheaffer, I’m curious if you’ve tried the white ones. I was about to order them, but I wanted your opinion.